Since this is my very first baby Gender Reveal card, I just had to share it with you. 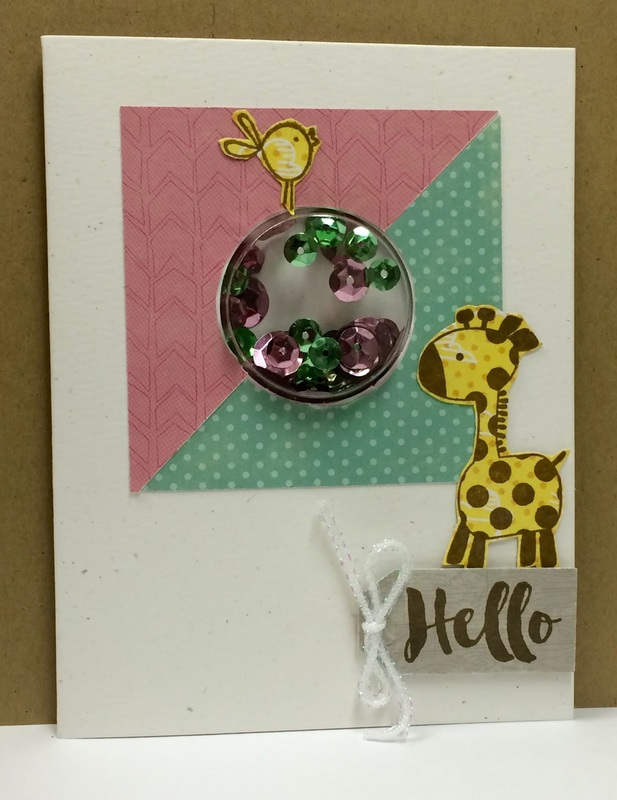 Have you had a chance to trythe new Shaker Cards by Jillibean Soup yet? They are so much fun and so easy to make. This is one that I created for an upcoming baby reveal party using cute new Healthy Hello and Mushroom Medley papers and two Hampton Art stamp sets. First I grabbed the new Shaker card components: card base, shape and sequins. I chose a boy and a girl color for the sequins to match the paper triangles, pink & aqua. 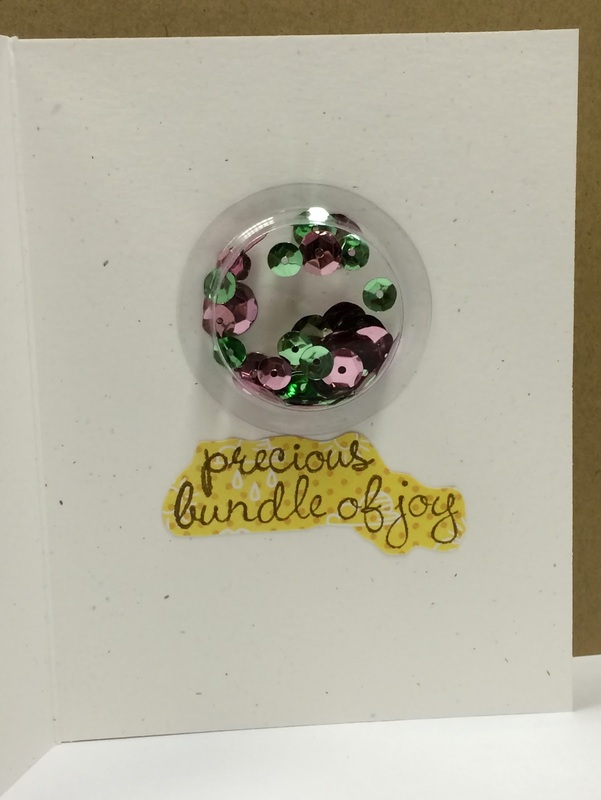 I placed the sequins in the shape, peeled the adhesive and dropped into the circle spot with card open. Then I closed the card to attach the shape in the correct spot. Next I stamped the sentiment in brown ink onto the gray paper and punched with a tag shaped punch. Then I stamped the bird and the giraffe onto the yellow pattern paper in brown ink as well. Those were fussy cut out and set aside to add back on later. Then I cut the matching paper triangles in pink pattern and aqua pattern paper from the new Healthy Hello collection. Those were attached to the card base as shown and using an exacto knife I cut out the circle opening. Last I attached the Hello tag with 3D foam dots and added the white bow. 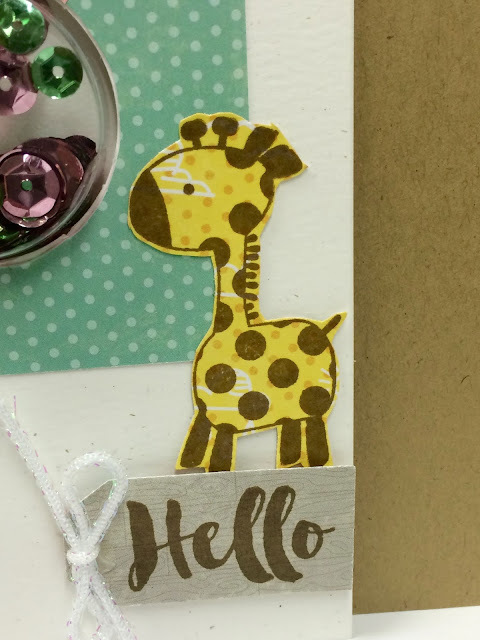 Then adhered the bird and giraffe as shown onto the card base. However, I still wanted a baby sentiment for the inside so I stamped the “precious bundle of joy” in brown ink onto the yellow pattern paper. I cut the sentiment out and attached it to card base under the shape as pictured. So now I am really looking forward to the party this weekend, because I have the perfect card for the occasion. Have you been to a Baby Gender Reveal Party? Did you make a card for the occasion? If so I would love to see it, please share in comments below! Sweet baby card. I love that little piece of yarn on the tag, too.